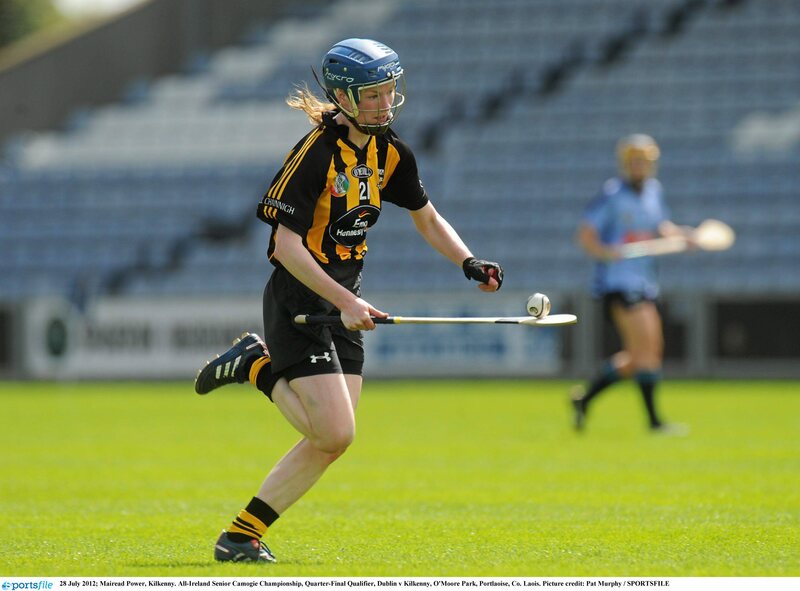 Mairead Power in action for Kilkenny. Power last week won an All-Star award for her performances with the county throughout the year. DCU and Kilkenny camogie star Mairéad Power has won her first Camogie All-Star. The Carrickshock native won the trophy for right corner back and was one of four Kilkenny players on the 2013 All-Star XV. The award has capped off an impressive year for Power at club, county and college level, having helped Carrickshock win the Junior B county title, Killkenny reach an All-Ireland final and DCU win the Purcell Cup. The 21-year-old is in her final year of Athletic Therapy and Training and is currently in the University of New Hampshire doing a semester of clinical placement. “I am working with the American football team here which is going great. I arrived in August, the day after winning the All-Ireland semi-final against Cork, worked for ten days and flew home again to train for the All-Ireland final”, said Power. Due to her placement, she wasn’t able to attend the All-Star awards ceremony in Croke Park, but her mother collected the award on her behalf. “My parents were at the All-Stars and my mother collected the award for me. They had a great night and sent me plenty of pictures. They are both very proud. I still can’t believe I won one! It never even crossed my mind that I might get nominated so to actually win it was a huge surprise. I’m delighted for the other three girls who won too, they were well deserved”, she said. Her county, Kilkenny, were unlucky to lose to Galway in the All-Ireland final, but it was still a successful season overall for The Cats. “This was our first year under new management and after a very disappointing season in 2012 I think we did very well to turn things around and reach the All-Ireland final this year. We were happy enough with our performance through the league despite losing the semi-final to Wexford”, she said. That victory meant that Power would line out in her first All-Ireland final in September, a day that would end in heartbreak. The 21-year-old also had a great year with her club, Carrickshock – a small club in South Kilkenny. They won the Junior B county final but unfortunately she wasn’t able to be there as she was in America. Despite this, she says her clubmates sent pictures and videos to involve her as much as they could. In terms of college camogie, last year’s team was the first from DCU to win the Purcell Cup two years in a row. Power arrives home from America on December 10th and is looking forward to getting back playing with DCU. “I’m definitely missing DCU camogie and all the girls this winter when I’m away. I’m keeping in touch with them through Facebook and keeping up to date with the matches and results. It’s certainly been a busy year for Power but looking at an All-Star award on the mantelpiece will surely make it all worthwhile. 2013 All Star Team: Susan Earner (Galway), Mairead Power (Kilkenny), Sarah Dervan (Galway), Lorraine Ryan (Galway), Edwina Keane (Kilkenny), Therese Maher (Galway), Chloe Morey (Clare), Niamh Kilkenny (Galway), Jennifer O’Leary (Cork), Katie Power (Kilkenny), Niamh McGrath (Galway), Kate Kelly (Wexford), Shelly Farrell (Kilkenny), Elaine Dermody (Offaly), Ailish O’Reilly (Galway).